152. SAUNAVA MANNA: C/O- LATE SHYAM SUNDAR MANNA, HOOGHLY-712410, MEMBERSHIP ID- MGI20170152. 153. PRASENJIT MONDAL: C/O- RAMMOHAN MONDAL, BURDWAN-713434, MEMBERSHIP ID- MGI20170153. 154. HASAN SARWARDI: C/O- SUKUR ALAM, MSD-742163, MEMBERSHIP ID- MGI20170154. 155. RAJIB MANDAL: C/O- ANANDA MANDAL, MALDA-732101, MEMBERSHIP ID- MGI20170155. 156. SUMIT KUMAR PRAMANICK: HOOGHLY-712125, MEMBERSHIP ID- MGI20170156. 157. MS MOUSUMI GUIN: C/O- SH UMAPADA GUIN, HOOGHLY-712134, MEMBERSHIP ID- MGI20170157. 158. SUBHANKAR MONDAL: C/O- SAMIR KUMAR MONDAL, NORTH 24 PGS-743427, MEMBERSHIP ID- MGI20170158. 159. SATYAPRIYA MAHATO: C/O- SUBHAS CHANDRA MAHATO, PURULIA-723151, MEMBERSHIP ID- MGI20170159. 160. SADHAN ROY: C/O- SANTOSH ROY, BANKURA-722207, MEMBERSHIP ID- MGI20170160. 161. JOYITA GHOSH: C/O- JOYDEB GHOSH, EAST BURDWAN-713519, MEMBERSHIP ID- MGI20170161. 162. DHIMAN MONDAL: KOLKATA-700150, MEMBERSHIP ID- MGI20170162. 163. SUKHEN MONDAL: C/O- ANANTA MONDAL, NADIA-741222, MEMBERSHIP ID- MGI20170163. 164. RINKU PRAMANIK: C/O- SHUVENDU PRAMANIK, PURBA MEDINIPUR-721448, MEMBERSHIP ID- MGI20170164. 165. SUPRIYO HALDER: C/O- SANNYSHI HALDER, SOUTH 24 PGS-743504, MEMBERSHIP ID- MGI20170165. 166. ALIM MONDAL: C/O- SAMER MONDAL, NORTH 24 PGS-743262, MEMBERSHIP ID- MGI20170166. 167. SANDIP MONDAL: C/O- TARUN MONDAL, HOWRAH-711410, MEMBERSHIP ID- MGI20170167. 168. PIU RAKSHIT: C/O- BABLU RAKSHIT, BANKURA-722137, MEMBERSHIP ID- MGI20170168. 169. SANTU SARKAR: C/O- MAHADEB SARKAR, SOUTH 24 PGS-743383, MEMBERSHIP ID- MGI20170169. 170. PUJA SANTRA: C/O- SANTI RANJAN SANTRA, NADIA-741222, MEMBERSHIP ID- MGI20170170. 171. SANTANU BANERJEE: C/O- SUBIR BANERJEE, PURBA MEDINIPUR-721152, MEMBERSHIP ID- MGI20170172. 172. JOYDEEP MANDAL: C/O- MONOJIT MANDAL, BANKURA-722133, MEMBERSHIP ID- MGI20170172. 173. ANAMUL MIAH: C/O- ANISUR MIAH, DAKSHIN DINAJPUR-733124, MEMBERSHIP ID- MGI20170173. 174. SUBHASISH BISWAS: C/O- BIKASH KANTI BISWAS, NADIA-742121, MEMBERSHIP ID- MGI20170174. 175. DEBASIS GHOSH: C/O- HARE KRISHNA GHOSH, HOOGHLY-712223, MEMBERSHIP ID- MGI20170175. 176. SUSOVON CHAKRABORTY: C/O- ASHOK KUMAR CHAKRABORTY, HOOGHLY-712407, MEMBERSHIP ID- MGI20170176. 177. SWARUP BHUIN: C/O- ANIL KR BHUIN, BANKURA-722152, MEMBERSHIP ID- MGI20170177. 178. SANTOSH BISWAS: C/O- SRIDAM BISWAS, PURBA BURDWAN-713152, MEMBERSHIP ID- MGI20170178. 179. ARJUN BARMAN: C/O- ASHUTOSH BARMAN, UTTAR DINAJPUR-733156, MEMBERSHIP ID- MGI20170179. 180. RAKHI BARMAN: C/O- UPENDRA NATH BARMAN, UTTAR DINAJPUR-733156, MEMBERSHIP ID- MGI20170180. 181. ANIMESH DAS: C/O- MANGAL CHANDRA DAS, MSD-742151, MEMBERSHIP ID- MGI20170181. 182. SHANTI PAUL: C/O- TRILOCHAN PAUL, PURULIA-723130, MEMBERSHIP ID- MGI20170182. 183. SANTU GOSWAMI: RAILA HIGH SCHOOL, PASCHIM MEDINIPUR-741201, MEMBERSHIP ID- MGI20170183. 184. DIPESH KOLEY: C/O- TAPAN KOLEY, BANKURA-722138, MEMBERSHIP ID- MGI20170184. 185. GOPAL PAIK: C/O- LATE RADHAKRISHNA PAIK, SOUTH 24 PGS-743383, MEMBERSHIP ID- MGI20170185. 186. SUMAN MAITY: C/O- TAPAS MAITY, NORTH 24 PGS-743446, MEMBERSHIP ID- MGI20170186. 187. PRABIR NASKAR: C/O- HAREKRISHNA NASKAR, SOUTH 24 PGS-743338, MEMBERSHIP ID- MGI20170187. 188. ANU MONDAL: C/O- ATINDU MANDAL, MSD-742175, MEMBERSHIP ID- MGI20170188. 189. RAJIB KUNDU: C/O- DHANANJOY KUNDU, BANKURA-722142, MEMBERSHIP ID- MGI20170189. 190. SANJOY RAJAK: C/O- MADHUSUDAN RAJAK, PURULIA-723148, MEMBERSHIP ID- MGI20170190. 191. SUSANTA KUMAR DAS: C/O- GOPAL CHANDRA DAS, PASCHIM MEDINIPUR-721445, MEMBERSHIP ID- MGI20170191. 192. ALOKESH SARKAR: C/O- GOPAL SARKAR, NADIA-741257, MEMBERSHIP ID- MGI20170192. 193. MANHUSHA BARMAN: C/O- CHANDRA MOHAN BARMAN, KOLKATA-700084, MEMBERSHIP ID- MGI20170193. 194. MALAY PRAMANIK: C/O- SAMIR PRAMANIK, PURBA MEDINIPUR-110067, MEMBERSHIP ID- MGI20170194. 195. SK AMANUR MONDAL: C/O- SK AMANAT MONDAL, PASCHIM BARDWAN-713206, MEMBERSHIP ID- MGI20170195. 196. SAMRAT SAHA: C/O- SAMARENDRA SAHA, MSD-742137, MEMBERSHIP ID- MGI20170196. 197. ABHIJIT PRAMANIK: C/O- JATINDRA NATH PRAMANIK, COOCHBEHAR-736159, MEMBERSHIP ID- MGI20170197. 198. PROSENJIT HALDAR: C/O- BABLU HALDAR, SOUTH 24 PGS-743503, MEMBERSHIP ID- MGI20170198. 199. ABDUL MATIN: SARIFUDDIN AHAMED, DAKHIN DINAJPUR-733124, MEMBERSHIP ID- MGI20170199. 200. UTPAL KUMAR DAS: C/O- ANJALI DAS, UTTAR DINAJPUR-733215, MEMBERSHIP ID- MGI20170200. 201. KSHIROD ORANG: C/O- LATE KUSHADHWAJ ORANG, PURULIA-723129, MEMBERSHIP ID- MGI20170201. 202. DEBABRATA DAS: C/O- MRITUNJOY DAS, NADIA-741161, MEMBERSHIP ID- MGI20170202. 203. AZIBUL ISLAM: C/O- ATAUR RAHAMAN, MSD-742304, MEMBERSHIP ID- MGI20170203. 204. RAJIB BAISHNAB: C/O- RABINDRANATH BAISHNAB, NORTH 24 PGS-743446, MEMBERSHIP ID- MGI20170204. 205. KUNAL KANTI BISWAS: C/O- SMT JOGAMAYA GHOSH, NORTH 24 PGS-700122, MEMBERSHIP ID- MGI20170205. 206. BAPPA SAHA: C/O- SANAT KUMAR SAHA, SOUTH 24 PGS-743513, MEMBERSHIP ID- MGI20170206. 207. RAKESH MANDAL: C/O- SUDHANGSU MANDAL, PURULIA-723132, MEMBERSHIP ID- MGI20170207. 208. MADHAB MONDAL: C/O- MAKHAN MONDAL, BIRBHUM-731133, MEMBERSHIP ID- MGI20170208. 209. SANTANA DEBNATH: C/O- SWAPAN DEBNATH, HOOGHLY-712104, MEMBERSHIP ID- MGI20170209. 210. PROSENJIT DAS: C/O- SANTI DAS, BURDWAN-713102, MEMBERSHIP ID- MGI20170210. 211. ASHOK SING BABU: C/O- GOPAL SING BABU, PURULIA-723152, MEMBERSHIP ID- MGI20170211. 212. SK HOSENUR: C/O- SK SAJID, MALDA-732205, MEMBERSHIP ID- MGI20170212. 213. JOYDEV MANDAL: C/O- HARADHAN, MSD-742224, MEMBERSHIP ID- MGI20170213. 214. SOMABHO BASU: C/O- TAPAS KUMAR BASU, KOLKATA-700079, MEMBERSHIP ID- MGI20170214. 215. DIPA KSHETRAPAL: C/O- RAM KSHETRAPAL, HOOGHLY-712149, MEMBERSHIP ID- MGI20170215. 216. NEKBAR SHAIKH: C/O- NIJAMUDDIN SK, MSD-742223, MEMBERSHIP ID- MGI20170216. 217. MD HOSNE MOBARAK: C/O- MD IMAJODDUIN MONDAL, BIRBHUM-731232, MEMBERSHIP ID- MGI20170217. 218. TARAMAY ROY: C/O- UTPAL ROY, BIRBHUM-731233, MEMBERSHIP ID- MGI20170218. 219. ENJAMUL HOQUE: C/O- AKBAR ALI, MALDA-732126, MEMBERSHIP ID- MGI20170219. 220. ARIJIT ADHIKARI: C/O- PRAHLLAD ADHIKARI, PASCHIM MEDINIPUR-721156, MEMBERSHIP ID- MGI20170220. 221. ANURADHA SAHA: C/O- ARABINDRA SAHA, MALDA-732101, MEMBERSHIP ID- MGI20170221. 222. MD JILARUDDIN AHAMED, C/O- MD GIASUDDIN SK, MALDA-732127, MEMBERSHIP ID- MGI20170222. 223. SUJAN BASAK: C/O- SADHAN BASAK, JALPAIGURI-734006, MEMBERSHIP ID- MGI20170223. 224. MRINAL SHIKARI: C/O- BISWAJIT ADHIKARY, SOUTH 24 PGS-700150, MEMBERSHIP ID- MGI20170224. 225. ABHIJIT SARKAR: C/O- MANIK CH. SARKAR, ALIPURDUAR-736121, MEMBERSHIP ID- MGI20170225. 226. SABBIR AHAMED: C/O- MD YEAHIA, MSD-742168, MEMBERSHIP ID- MGI20170226. 227. ADITI BARMAN: C/O- HARIPADA BARMAN, PASCHIM MEDINIPUR-721102, MEMBERSHIP ID- MGI20170227. 228. SK HASIBUL HASAN: C/O- SK NUR SALIM, BIRBHUM-731204, MEMBERSHIP ID- MGI20170228. 229. AMARTYA PANI: C/O- TAPAN PANI, JHARGRAM-721505, MEMBERSHIP ID- MGI20170229. 230. DEBMALYA PAL: C/O- DEBASIS PAL, HOOGHLY-712235, MEMBERSHIP ID- MGI20170230. 231. MD SELIM MOLLA: C/O- MD SAMSUL ALAM MOLLA, SOUTH 24 PGS-743609, MEMBERSHIP ID- MGI20170231. 232. PIJUSH SARKAR: C/O- PRAVAT SARKAR, MSD-742151, MEMBERSHIP ID- MGI20170232. 233. ANSHUMAN MONDAL: C/O- MANAB KUMAR MONDAL, MSD-742159, MEMBERSHIP ID- MGI20170233. 234. DEBASHIS DAN: BANKURA-722205, MEMBERSHIP ID- MGI20170234. 235. SUBRATA MONDAL: C/O- GOPAL MONDAL, HOWRAH-711109, MEMBERSHIP ID- MGI20170235. 236. TAMAL MAHAPATRA: C/O- PANKAJ KUMAR MAHAPATRA, BANKURA-722150, MEMBERSHIP ID- MGI20170235. 237. SUBHASISH RAJAK: C/O- KALIKINKAR RAJAK, BIRBHUM-731220, MEMBERSHIP ID- MGI20170237. 238. PARTHA SARATHI DAS: C/O- ATUL CHANDRA DAS, PURBA MEDINIPUR-721651, MEMBERSHIP ID- MGI20170238. 239. TUHIN SINGHA: C/O- TAPAN SINGHA, HOWRAH-711205, MEMBERSHIP ID- MGI20170239. 240. MD SAFIUR RAHAMAN: C/O- ABDUL HOQUE, MSD-742202, MEMBERSHIP ID- MGI20170240. 241. ABDUS SAMAD: C/O- NUR ISLAM, MSD-742223, MEMBERSHIP ID- MGI20170241. 242. DHANANJOY MAJHI: C/O- NABIN CHANDRA MONDAL, PURULIA-723101, MEMBERSHIP ID- MGI20170242. 243. SAPTARSHI GHOSH: C/O- SASIM KUMAR GHOSH, NADIA-741302, MEMBERSHIP ID- MGI20170243. 244. SUBHAJIT BERA: C/O- SUBAL CHANDRA BERA, PASCHIM MEDINIPUR-721445, MEMBERSHIP ID- MGI20170244. 245. MONIKANTA MONDAL: C/O- MAHADEB MONDAL, NADIA-741404, MEMBERSHIP ID- MGI20170245. 246. PRITHA GHOSH: C/O- UDAY CHAND GHOSH, HOOGHLY-712134, MEMBERSHIP ID- MGI20170246. 247. SWADESH MALICK: C/O- BANKIM MALICK, PURBA BURDWAN-713104, MEMBERSHIP ID- MGI20170247. 248. MRIDANGA MONDAL: C/O- BANINDRA NATH MONDAL, MSD-742157, MEMBERSHIP ID- MGI20170248. 249. LIMPA HAZRA: C/O- NABA KUMAR HAZRA, HOWRAH-711106, MEMBERSHIP ID- MGI20170249. 250. TANMOY DEBNATH: C/O- AJIT DEBNATH, NADIA-741238, MEMBERSHIP ID- MGI20170250. 251. GOUR KASYA: C/O- GANESH KASYA, UTTAR DINAJPUR-733128, MEMBERSHIP ID- MGI20170251. 252. CHIRANTAN BISWAS: C/O: HARADHAN BISWAS , NADIA-741156, MEMBERSHIP ID- MGI20170252. 253. AMIT DHALI: C/O- KASHI NATH DHALI, NORTH 24 PGS-743126, MEMBERSHIP ID- MGI20170253. 254. PRADIP SINGHA: C/O- LAKSHMAN SINGHA, BANKURA-722207, MEMBERSHIP ID- MGI20170254. 255. RIYA DAS: C/O- NABA KUMAR DAS, HOOGHLY-712404, MEMBERSHIP ID- MGI20170255. 256. ANUPAM RAJAK: C/O- MILON KUMAR RAJAK, BIRBHUM-731204, MEMBERSHIP ID- MGI20170256. 257. DEBRAJ KUMBHAKAR: C/O- BASUDEB KUMBHAKAR, PURULIA-723153, MEMBERSHIP ID- MGI20170257. 258. JAYANTA KARMAKAR: C/O- RABIN KARMAKAR, NORTH 24 PGS-743412, MEMBERSHIP ID- MGI20170258. 259. RAMESH MAJHI: C/O- MOHAN MAJHI, PURULIA-723143, MEMBERSHIP ID- MGI20170259. 260. KALIKINKAR DAS: C/O- BIPAD TARAN DAS, MALDA-732216, MEMBERSHIP ID- MGI20170260. 261. SURAJIT SADHUKHAN: C/O- DEBASISH SADHUKHAN, KOLKATA-700041, MEMBERSHIP ID- MGI20170261. 262. SONIA ROY: C/O- ASIT KUMAR ROY, PURBA BURDWAN-713101, MEMBERSHIP ID- MGI20170262. 263. IKBAL HOSSAN: C/O- EBRAHIM SAIKH, MSD-742223, MEMBERSHIP ID- MGI20170263. 264. MASUD AL HASAN: C/O- MD TAKSER ALI, MSD-742133, MEMBERSHIP ID- MGI20170264. 265. KALYAN BARMAN: C/O- DHIRESH BARMAN, UTTAR DINAJPUR-733129, MEMBERSHIP ID- MGI20170265. 266. MD HASANUZZAMAN: C/O- MD LIAKAT ALI, MALDA-732201, MEMBERSHIP ID- MGI20170266. 267. SOUMITRA DAS: C/O- TAPAN KUMAR DAS, PURBA MEDINIPUR-721628, MEMBERSHIP ID- MGI20170268. 268. SUDIPTA PAN: C/O- SANAT KUMAR PAN, MSD-742401, MEMBERSHIP ID- MGI20170268. 269. MALAY KUMAR PRAMANICK: C/O- HARADHAN PRAMANICK, HOWRAH-711226, MEMBERSHIP ID- MGI20170269. 270. ILORA PRAMANIK: OTHER STATE (₹350), MEMBERSHIP ID- MGI20170270. 271. SMARAJIT KABIRAJ: C/O- JIBAN KABIRAJ, NADIA-741165, MEMBERSHIP ID- MGI20170271. 272. SATABDI MUKHERJEE: C/O- MANAS GHOSAL, BIRBHUM-731216, MEMBERSHIP ID- MGI20170272. 273. RAMEN SAHA: C/O- RATAN KUMAR SAHA, NADIA-741126, MEMBERSHIP ID- MGI20170273. 274. DEBMALA BANERJEE: C/O- SHYAMA PROSAD BANERJEE, NADIA-741201, MEMBERSHIP ID- MGI20170274. 275. ALPANA BISAI: C/O- ASHOKE KUMAR BASAI, KOLKATA-700096, MEMBERSHIP ID- MGI20170275. 276. ARIJIT MONDAL: C/O- JYOTISH MONDAL, HOWRAH-711312, MEMBERSHIP ID- MGI20170276. 277. SUDARSHAN MANDAL: C/O- JITENDRA MANDAL, MALDA-732206, MEMBERSHIP ID- MGI20170277. 278. PINTU DAS: C/O: KANAI CHANDRA DAS, PURBA BURDWAN-713102, MEMBERSHIP ID- MGI20170278. 279. NETAI MANDAL: C/O: UDAY SHANKAR GHOSH, MALDA-732133, MEMBERSHIP ID- MGI20170279. 280. SUBHRADEEP GHOSH: C/O- SAJAL GHOSH, HOOGHLY-712125, MEMBERSHIP ID- MGI20170280. 281. SUMAN SAHA: C/O- SAHA RANJAN SAHA, NADIA-741257, MEMBERSHIP ID- MGI20170281. 282. ADDAS ALI MIDDYA: C/O- MEHER MIDDYA, BANKURA-722207, MEMBERSHIP ID- MGI20170282. 283. JYOTI MONDAL: C/O: ARABINDA MONDAL, NORTH 24 PGS-743423, MEMBERSHIP ID- MGI20170283. 284. SANJOY GHOSH: C/O- SUSHIL CHANDRA GHOSH, MALDA-732142, MEMBERSHIP ID- MGI20170284. 285. TUHINA MAITI: C/O- TAPAN KUMAR MAITI, PURBA MEDINIPUR-721439, MEMBERSHIP ID- MGI20170285. 286. RABISANKAR DAS: C/O- SUKDEB DAS, HOOGHLY-712123, MEMBERSHIP ID- MGI20170286. 287. ARPAN MANDAL: C/O- BIDHAN CH. MANDAL, PURULIA-723131, MEMBERSHIP ID- MGI20170287. 288. ARINDAM DUTTA: C/O- ARUN KUMAR DUTTA, MSD-742302, MEMBERSHIP ID- MGI20170288. 289. MD SANAULLAH: C/O- ABDUL MAZID, MALDA-732201, MEMBERSHIP ID- MGI20170289. 290. SHOUNAK SEAL: C/O- SOUMYAJIT SEAL, HOOGHLY-712101, MEMBERSHIP ID- MGI20170290. 291. ATIUR RAHAMAN: C/O- ABOL HOSSAIN, MSD-742223, MEMBERSHIP ID- MGI20170291. 292. NANDITA ADHIKARI: C/O- BHASKAR ADHIKARI, MSD-742138, MEMBERSHIP ID- MGI20170292. 293. TIMIRBARAN MAHATA: C/O- NIYATI MAHATA, PASCHIM MEDINIPUR-721513, MEMBERSHIP ID- MGI20170293. 294. IKRAMUL MONDAL: C/O- ALI KADAR MONDAL, NORTH 24 PGS-743710, MEMBERSHIP ID- MGI20170294. 295. PRABIR BHATTACHARYA: C/O- PINTU BHATTACHARYA, PURBA BARDDHAMAN-713144, MEMBERSHIP ID- MGI20170295. 296. EKRAMUL BISWAS: C/O- MUSIAR RAHAMAN BISWAS, NADIA-741253, MEMBERSHIP ID- MGI20170296. 297. ANIRUDHYA DUTTA: C/O- ASHOKE KR. DEY, BANKURA-722202, MEMBERSHIP ID- MGI20170297. 298. MIR MD JASIMUDDIN: C/O- MIR MD SAHARAB HOSSAIN, PURBA BARDHAMAN-713143, MEMBERSHIP ID- MGI20170298. 299. AJAY PRASAD: C/O- LATE BIJOY PRASAD, MALDA-732122, MEMBERSHIP ID- MGI20170299. 300. FARUK ABDULLA: C/O- LATE ABDUL MANNAN, MSD-742212, MEMBERSHIP ID- MGI20170300. 301. ANIRBAN SINGH PARMER: C/O- AMIYA KR SINGH PARMER, MALDA-732101, MEMBERSHIP ID- MGI20180301. 302. JABEDUR RAHAMAN: C/O- ABDUR SABUR, MSD-742227, MEMBERSHIP ID- MGI20180302. 303. SOUVIK KHAN: C/O- RABINDRANATH KHAN, PURULIA-723101, MEMBERSHIP ID- MGI20180303. 304. INDRANIL GHOSH, C/O- INDRAJIT GHOSH, DARJEELING-734003, MEMBERSHIP ID- MGI20180304. 305. PRADIP PAUL: C/O- SWADWSH SAHA, UTTAR DINAJPUR-733134, MEMBERSHIP ID- MGI20180305. 306. PRINCE RANA PROTAP CHOWDHURY: C/O- RATAN KUMAR CHOWDHURY, MSD-742123, MEMBERSHIP ID- MGI20180306. 307. SOUMEN BARAL: KOLKATA-700130, MEMBERSHIP ID- MGI20180307. 308. SANTU GHOSH: C/O- BISWAJIT GHOSH, PASCHIM BARDHAMAN-713212, MEMBERSHIP ID- MGI20180308. 309. MD SAFATULLAH: C/O- SAHEBJAN ALI, MALDA-732103, MEMBERSHIP ID- MGI20180309. 310. KARTICK CHANDRA MANDAL: C/O- PRASANTA KUMAR MANDAL, BIRBHUM-731303, MEMBERSHIP ID- MGI20180310. 311. ANUP KUMAR GHOSH: C/O- UDAY CHANDRA, PURBA BARDHAMAN-713125, MEMBERSHIP ID- MGI20180311. 312. APARUPA BISWAS: C/O- GORA CHAND SARKAR, JHARGRAM-721507, MEMBERSHIP ID- MGI20180312. 313. DR. NARENDRANATH GURIA (Rs. 350): CHHATTISGARH-495554, MEMBERSHIP ID- MGI20180313. 314. ASIM BISWAS: C/O- ATUL CHANDRA BISWAS, NADIA-741238, MEMBERSHIP ID- MGI20180314. 315. PARTHA MAHATA: C/O- GANESH ROY, NORTH 24 PGS-700124, MEMBERSHIP ID- MGI20180315. 316. 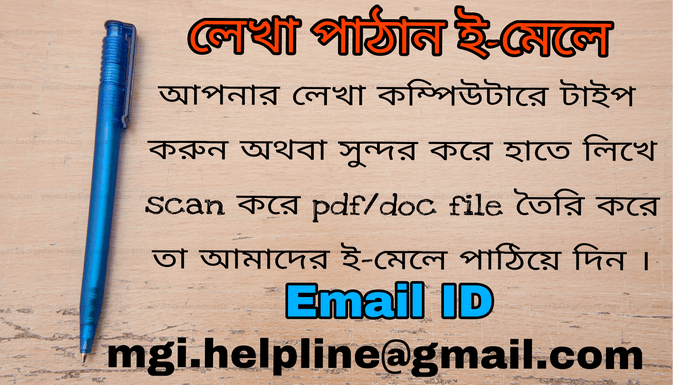 MOLLA JIAUR RAHAMAN: C/O- MOLLA SUMSUR RAHAMAN, PURBA BARDHAMAN-713103, MEMBERSHIP ID- MGI20180316. 317. SUNNAT ALI: C/O- MASUD KHAN, BIRBHUM-731303, MEMBERSHIP ID- MGI20180317. 318. KALYANBRATA SARKAR: C/O- KALIPADA SARKAR, NADIA-741163, MEMBERSHIP ID- MGI20180318. 319. PRASANTA SARKAR: C/O- JATINDRA NATH SARKAR, NADIA-741126, MEMBERSHIP ID- MGI20180319. 320. DEBASIS SAU: C/O- HARIPADA SAU, PURBA MEDINIPUR-721439, MEMBERSHIP ID- MGI20180320. 321. SAYANTANI BASU: HOOGHLY-712201, MEMBERSHIP ID- MGI20180321. 322. JAYANTA HALDAR: C/O- KISHORI HALDAR, MALDA-732142, MEMBERSHIP ID- MGI20180322. 323. SOURAV GHOSH: C/O- GOPAL GHOSH, HOWRAH-711411, MEMBERSHIP ID- MGI20180323. 324. MANDIRA DAS: C/O- ASOKE KUMAR DAS, EAST BURDWAN-713104, MEMBERSHIP ID- MGI20180324. 325. RUPAYAN SARDAR: C/O- MANUJENDRA NATH SARDAR, SOUTH 24 PGS-743368, MEMBERSHIP ID- MGI20180325. 326. ANANYA BISWAS: MEMBERSHIP ID- MGI20180326. 327. HIMADRI SEKHAR MURA: C/O- ALOKE KUMAR PANDEY, MALDA-732103, MEMBERSHIP ID- MGI20180327. 328. SUKANTA HAJRA: C/O- JAYDEB HAJRA, HOOGHLY-712401, MEMBERSHIP ID- MGI20180328. 329. ABDUR RAHIM: C/O- MD SETABUDDIN, MALDA-732125, MEMBERSHIP ID- MGI20180329. 330. DEBASHIS GHOSH: C/O- LATE DILIP GHOSH, SOUTH 24 PGS-743383, MEMBERSHIP ID- MGI20180330. 331. SWAPNA SARDAR: C/O- GOUTAM SARDAR, SOUTH 24 PGS-700149, MEMBERSHIP ID- MGI20180331. 332. SANUNAY NANDI: C/O- SUBASH NANDI, BIRBHUM-731125, MEMBERSHIP ID- MGI20180332. 333. ANIMESH GARAI: C/O- KIRITY GARAI, BIRBHUM-731234, MEMBERSHIP ID- MGI20180333. 334. SUMANA MONDAL: C/O- BHARATI MONDAL, SOUTH 24 PGS-743331, MEMBERSHIP ID- MGI20180334. 335. SUBHANKAR GHOSH: C/O- SANTOSH GHOSH, HOWRAH-711410, MEMBERSHIP ID- MGI20180335. 336. PARU JHOTI HALDAR: C/O- PABITRA JHOTI HALDAR, SOUTH 24 PGS-743395, MEMBERSHIP ID- MGI20180336. 337. BHARAT MAHATO: C/O- DAYAMAY MAHATO, PURULIA-723102, MEMBERSHIP ID- MGI20180337. 338. KHURSID ALAM KHAN: C/O- KHAJA UDDIN KHAN, NADIA-741154, MEMBERSHIP ID- MGI20180338. 339. KANCHAN MANDAL: C/O- LATE SAMIR KUMAR MANDAL, PURULIA-723133, MEMBERSHIP ID- MGI20180339. 340. SAJAL MAJUMDER: C/O- BHUPENDRA NATH MAJUMDER, DAKSHIN DINAJPUR-733101, MEMBERSHIP ID- MGI20180340. 341. ARINDAM DAS: C/O- ANANDA DAS, MSD-742227, MEMBERSHIP ID- MGI20180341. 342. DIPAK MAHATO: AT-AGUIBIL HIGH SCHOOL, PURULIA-723129, MEMBERSHIP ID- MGI20180342. 343. HIMANGSHU BASUNIYA: C/O- DHRUBA NATH BASUNIYA, JALPAIGURI-735210, MEMBERSHIP ID- MGI20180343. 344. SOMA GHOSH PAL: C/O- SAROJ KUMAR PAL, HOOGHLY-712134, MEMBERSHIP ID- MGI20180344. 345. PAROMITA DHARA: C/O- RAMKRISHNA DHARA, DAKSHIN DINAJPUR-733127, MEMBERSHIP ID- MGI20180345. 346. AMRITA HALDAR: C/O- BHARAT CHANDRA HALDAR, NADIA-741165, MEMBERSHIP ID- MGI20180346. 347. DIBYENDU MANNA: C/O- MRITYUNJOY MANNA, HOWRAH-7411410, MEMBERSHIP ID- MGI20180347. 348. AVIJIT SAHA: C/O- SADHAN SAHA, ALIPURDUAR-736121, MEMBERSHIP ID- MGI20180348. 349. SAMIM AKHTAR: C/O- GAZLU SHAIKH, MSD-742166, MEMBERSHIP ID- MGI20180349. 350. BAIDYANATH ORANG: C/O- NIBARAN ORANG, WEST BURDWAN-713331, MEMBERSHIP ID- MGI20180350. 351. SUSANTA GHOSH: SOUTH 24 PGS-700150, MEMBERSHIP ID- MGI20180351. 352. SK MINHAZ AFROZ: C/O- SK ABDUL WAHAB, HOOGHLY-712412, MEMBERSHIP ID- MGI20180352. 353. SOUMYADEEP BARIK: C/O- SANAT KUMAR BARIK, SOUTH 24 PGS-700144, MEMBERSHIP ID- MGI20180353. 354. SOURAV LAYEK: C/O- SAMAR KUMAR LAYEK, PASCHIM BURDWAN-713333, MEMBERSHIP ID- MGI20180354.